Dealer-Insight focuses on the European session of FX trading, and has imminent plans of providing coverage until 22:00 GMT, with a long term goal of adding Asian analysts and going 24 hours. The stream of headlines and comments is dominated by FX, but is peppered with cross asset updates. On this, Pomery explained “FX is the predominant asset we cover, but we also cover the yields markets, commodities and equities as they have similar risk tolerances to FX.” In addition to updates from traders and dealers, Dealer-Insight also provides updates buying/selling being done by central banks. Currently, Dealer-Insight is available for £80/month through a subscription on their website, and will soon be available through the Tradable platform when it is expected to officially go live with brokers in February. Pomery explained that Dealer-Insight is also planning on launching the product with additional trading platform providers and brokers. Having played with the product for a week, my first thoughts are whether it’s worth £80/month? Much of that answer depends on the type of trader using it. In terms of quality, where I found the most use of the analysis was in connection to big moves. Specifically, after the large recent moves in the USDJPY & EURCHF, Dealer-Insight provided ongoing updates of whether traders were continuing to ride the momentum or cashing out. Included in the updates is a color guide of green, yellow, red, that indicates how ‘hot’ the update is. A few areas that I though could be improved would be the ability to search and charts. Pomery explained that these functions are in the pipeline to be released as the product develops. Overall, I like the product. When I traded equities, I was a big user of Briefing.com. 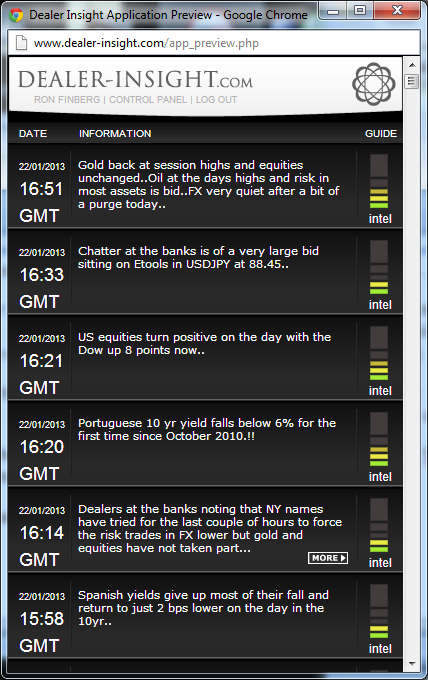 It provided a similar InPlay service with real time updates of news and moves for the US equity market. Therefore, with that bias, I have been curious to see a similar premium version be created for FX. Having used Briefing, the experience is that one you get started with receiving quality updates, you feel lacking without them. Therefore, I have the feeling that the same would occur with a product like Dealer-Insight. can the dealer insight show actual net volumes long/short the broker or institutions are carrying/processing? Of the four pieces of news presented in the image above, only two could be called “inside information on what the bigger players are doing” (the 2nd and 5th from top). I wouldn’t pay for such a service (not to mention how easy it is to manipulate the market by disseminating rumours disguised as “financial gossip” or “inside knowledge”). I deeply dislike these startups which have nothing serious to offer and only surround themselves with noise and hype. How is this service different from say; forexlive.com, that provide what sounds like similar info but for free? I spoke Maurice from Dealer-Insight and he said there is no ‘net volume’ data. He added that banks typically provide unreliable figures as they often tend to overstate their order flow.